This is such a beautiful salad, nobody will really care that much about how it tastes. But luckily, it tastes amazing as well. It’s great as a side dish or for an entire lunch. You can add protein by adding some feta cheese in there, but as I was pairing it with a meat dish, I avoided the dairy. 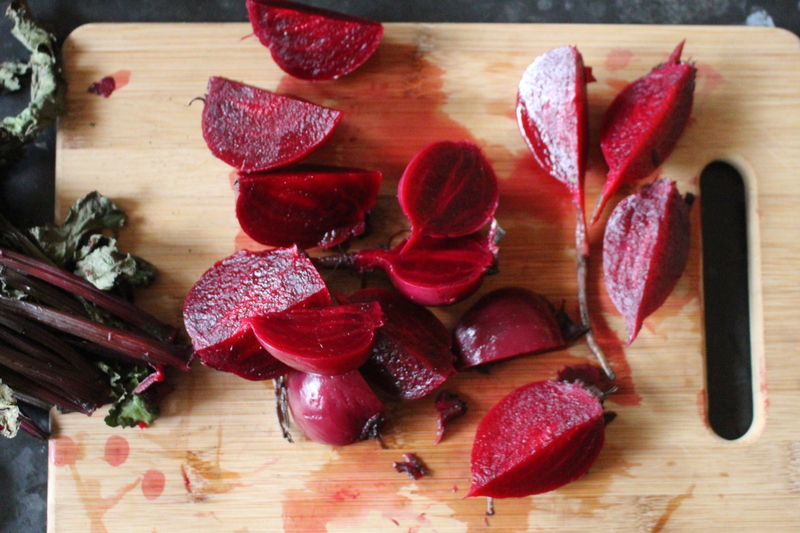 My favourite part is peeling the beets. After being boiled their skin peels beautifully and the colour is bright and in perfect contrast with the kale. I used wild rice that was already pre-cooked to make it faster, but you shouldn’t take the easy route (tho, who am I to say?). 4 medium beets- boiled for about 2 hrs, until fork tender. Chop the beets and kale, mix with rice. Mix all the dressing ingredients and shake well. Pour dressing over the salad and add the almonds. Refrigerated for a few hours tastes better. Esta ensalada es tan bonita cómo exquisita. El contraste de colores entre el kale y los betabeles la hacen ver increíble, y agregándole un poco de feta lo convierte en una comida completa, o el complemento perfecto para cualquier platillo. La mejor parte es pelar los betabeles después de hervirlos. La piel se desliza como aceite. 4 betabeles hervidos por 2 horas, medianos. Cortar y pelar los betabeles hervidos. Cortar el kale. Combinar con el arroz salvaje. Mezclar el vinagre, aceite, ajo, mostaza, sal y pimienta y revolver. Cubrir la ensalada y espolvorear con almendras. Es preferible refrigerarla por una noche, o varias horas (pero no necesario). Me encantan los colores de esta ensalad. Que rico!